Discrete and intimate yet deeply luxurious and lavish, The Inn of The Five Graces is an amazing romantic and secluded hotel glowing with a warm, welcoming ambience. This impeccable bolthole is like nothing else you will comes across on your American travels, with the charming and exquisite interiors of the hotel combined with the awe inspiring settings guaranteed to take your breath away. 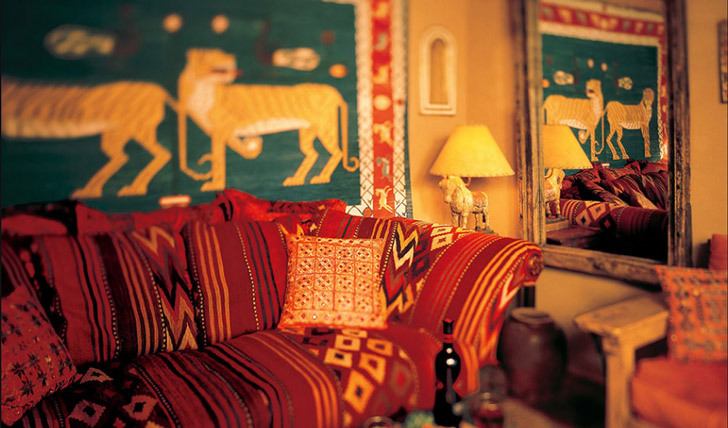 The 24 rooms and suites, gathered around a courtyard, are all individually furnished by owners Ira and Sylvia Seret, their passion for traditional artisan craftsmanship shining through the eclectic mix of pieces collected from far off lands. Idyllically placed in the middle of spectacular desert landscapes and vast mountain ranges, a stay here is the complete antithesis to life in the bright lights of a busy urban city. 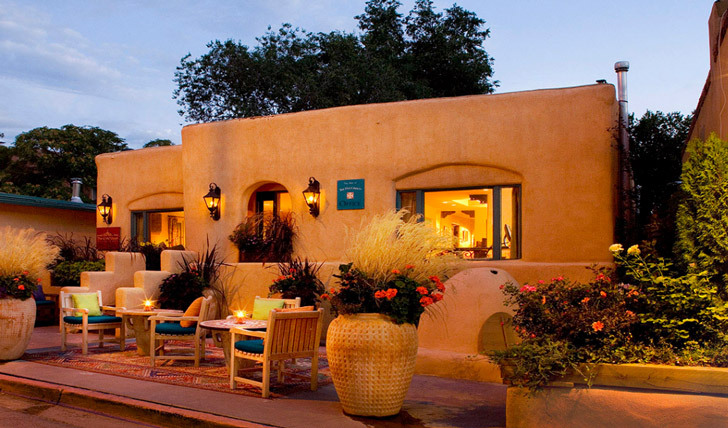 The Inn of The Five Graces was previously a cluster of neglected historical buildings just minutes away from the heart of Old Santa Fe. Placed along the Old Santa Fe trail, the cities winding and twisting roads are full of stories and adventures waiting to be discovered. A cultural hub of art and style and one of the oldest cities of America, there is plenty to explore and learn in Santa Fe. The home and inspiration for Georgia O’Keefe’s later years, Santa Fe is an art enclave with many museums to spend your days casually strolling through with numerous sumptuous restaurants providing the perfect pit stops from your cultural learning. The resort is an hour from Albuquerque International Airport which has many connections to the larger US cities or a 20 minute drive from Santa Fe Airport with flights arriving from LA and Dallas. Or if you are eagerly immersing yourself in a legendary American road trip, Santa Fe is a one hour drive off the iconic route 66. A kaleidoscope of exotic jewel colours, vibrant patterns and plush textures, the rich, lavish rooms and suites at The Inn of the Five Graces are an art destination themselves. With all furniture handpicked from far off romantic destinations of the East, the rooms are filled with fascinating and intriguing delights such as carved Indian doors, Turkish kilims and Central Asian ikats. The highlight of the rooms is definitely the magnificent bathroom. Exquisite mosaics, all designed and made by Sylvia Seret, grace the walls of this incredible haven equipped with walk-in showers, baths built for two and piles of plush white robes and towels. Take a step into this jewellery box filled with Eastern allures and charms and you may find it hard to leave. An innovative combination of Tibetan and Eastern influences with contemporary modern day opulence, the High Mountain Tibetan Spa is a glorious way to spend a few hours. The treatments match the splendid and unique setting of gold, crimson walls and calming, crackling stone fireplace. Taking inspiration from the Ayurvedic system of longevity, rejuvenation and health through soothing oil infusions of flowers and herbs, rare plant extracts and soothing touch, you will find it difficult to choose which of the relaxing and healing treatments to choose from.